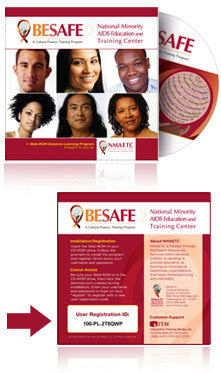 This program trains health care providers on how to use BESAFE model to provide culturally appropriate care to minority patients living with HIV/AIDS. Health care professionals who are sensitive and attentive to their patient’s cultural beliefs and values have patients who are more likely to adhere to treatment regimens and return for follow up visits. Rich media including course unit videos, case studies, quizzes, study questions, expert commentary, and additional resources for the optimal learning experience. Anywhere, anytime learning that reduces course time and expense for both participants and trainers. Updateability for instant access to guidelines and treatment options. Updating happens automatically each time a participant logs in. Distance learning Web-ROM technology combines the rich video capacity of CD-ROM with the network and database capabilities of the web to deliver a robust multimedia experience, regardless of Internet connection. A database for accountability of all participant learning and achievements, including tracking of certification progress. 1. Each participant must register with the unique user ID on their Web-ROM packaging and supply personal information for the database. They then create a username and password. 2. Users must login with their username and password each time they view the program. Participant activity and progress is then recorded. 3. This progress data is available for the student using the program via a "Check Progress" screen. Administrators use the admin website to view their students' progress and learning. Program Administrators and trainers login in to check participant progress, download program components for seminar-training sessions, create reports on program usage and participant achievements, and file pertinent participant data for evaluation purposes.